Some say that resolutions are made to be broken. I look at them as a way to take some time to assess where you are in life, where you want to be, reevaluate your priorities, and appreciate all that you have. I am not a person who makes resolutions and gets mad or depressed when they don't work out. I try to stick with attainable goals or at least goals that will make me a better person in the long run. 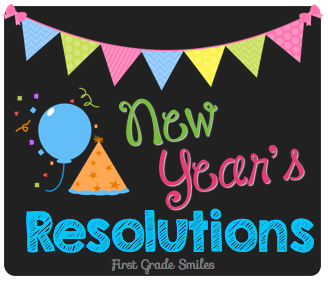 For this post, I'm linking up with First Grade Nest to share these New Year's Resolutions. 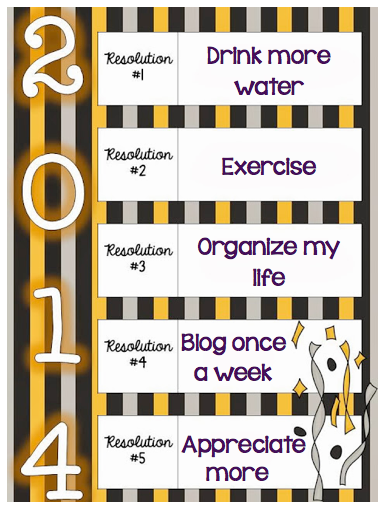 Hop on over to Jessica's adorable blog and check out some other favorite bloggers' resolutions. You might find one that inspires you. This is pretty self-explanatory. I never drink enough water. I want to live a healthier lifestyle in general and drinking more water is one small part of that. I've read that drinking a glass of water right when you wake up in the morning is great to jumpstart your body for the day. I also plan to drink a glass of water before eating - both meals and when I feel like snacking. Although I do plan on eating healthier, I do not plan on following any sort of diet. Some small things I plan to do to help with this are: buy fresh fruits and veggies 2 times a week so they are really fresh, eat more homemade soup and salad for meals (I've been pinning recipes like a crazy woman lately to help with this one), pre-package healthy snacks for grab-and-go, and of course drink more water! I know, I know! This is EVERYONE'S new year's resolution. But I'm just keeping it simple. I'm not saying how often. I'm not setting any specific goals just yet. I just want to find more time to exercise. I want my treadmill to feel less lonely. I want to listen to my workout mix on my iPod. I want an excuse to buy some cute workout clothes. I will exercise! I don't know how much or how often - but it will happen. To help me with this resolution I've downloaded the My Fitness Pal app. I've started following some people on Instagram for inspiration. I will, of course, start finding some pinspiration as well. This one sounds little over the top, but I just want to find more ways to be organized in every aspect of my life. Unfortunately I can't really spend the money to buy all the super cute containers, boxes, bins, shelves, etc. that I really want - so I have to get creative. Again, I'm relying on Pinterest for help. I started a new board, Organize This. Pinterest is filled with organizational tips, so I'm looking to put some of them in action. This past year I created some binders for our home: one for all our bills and one for all of our important papers like birth certificates, marriage license, etc. This has helped tremendously. For next year, I want to find a way to organize incoming papers (mail, school papers) that works for me. There are so many ideas out there, but I will need to find something that works with our daily living. I also want to organize better when it comes to grocery shopping: lists, coupons, menu planning. This will be a tough one for me, especially since I am finding less people are checking my blog and more people are finding me on my Facebook page. It seems as though people are not commenting on blog posts as much as before, myself included. So therefore, I will also add to this resolution to comment myself at least once a week on another blog. I want and need to spread the love a little too! This is a good reminder for all of us. Each one of us has so many things to be thankful for. When I'm stressed it is so easy to get short with the people I love. I want to spend more time telling them all the things I appreciate about them. I want to take a step back from whatever is stressing me and recognize the positives and not dwell on the negatives. Do I need to point out to my husband when he leaves the milk on the counter, or could I just put it away and not say anything? Should I sigh when my daughter wants just one more book at bedtime because I have school work to do, or could I think about how wonderful it is that she wants more time with me? This past year has been difficult in many ways and reminds me how precious our time is with the ones we love. I want to know that I didn't take that time for granted and I tried to show them that I appreciate them. I'm honored that you took the time to read my little blog. What great goals...Happy New Year! Love resolution 5. Thanks for the reminder…life is too short to worry about the small things!